I’m travelling in Europe and the US for the next month or so, with an exciting combination of work meetings, weddings, visiting places to write about, and hopefully the occasional piece of not doing anything at all. This will be good. SNCF’s train ticketing has become quite good since I last used it. The Oui.sncf website is available in English, is clear and easy to use, and allows direct selection of your reserved seat in the same way that even the shonkiest airlines do. Although unlike the shonky airlines, it doesn’t charge you extra for doing so. Prices weren’t super-cheap, being booked only a couple of weeks in advance, but by sticking to off-peak trains they also weren’t super-expensive. SNCF do the pricing policy which I generally associate with UK rail, where first class advance tickets cost almost the same as standard class advance tickets if you buy them a couple of weeks before departure. So first class it is! Payment with a foreign credit card and address worked absolutely fine, and there didn’t seem to be any particularly ridiculous surcharges or similar shenanigans . The site took American Express, which is always a good measure of whether an establishment is good and righteous or shady and half-arsed. The tickets were delivered as PDFs with a QR code. They also came with a plethora of station, journey and destination information by email, which would be particularly handy if doing French rail for the first time. According to the T&Cs the tickets need to be printed out clearly on white paper, which is a minor annoyance. SNCF does also have an app you can download which apparently does direct e-ticketing, but that seems like a bit of a gratuitous download for someone who doesn’t live very near France. But overall, good work SNCF. The Eurostar train ticketing experience was pretty similar in that the website was broadly usable and successfully sold me an e-ticket for printing via Amex, although the tickets were somewhat pricier, there was no bargain basement first class availability, there isn’t an app option, the app option was easy to miss when booking tickets, thanks @joncstone, there wasn’t a seat-choosing option, and there was much less hand-holding about how to use the train . This is more or less the minimum I’d expect from a rail operator – it’s about the same as NSW Trainlink, the extremely low-rent operation that serves country New South Wales. Although the Eurostar site is admittedly prettier and less austerely functional than Trainlink. 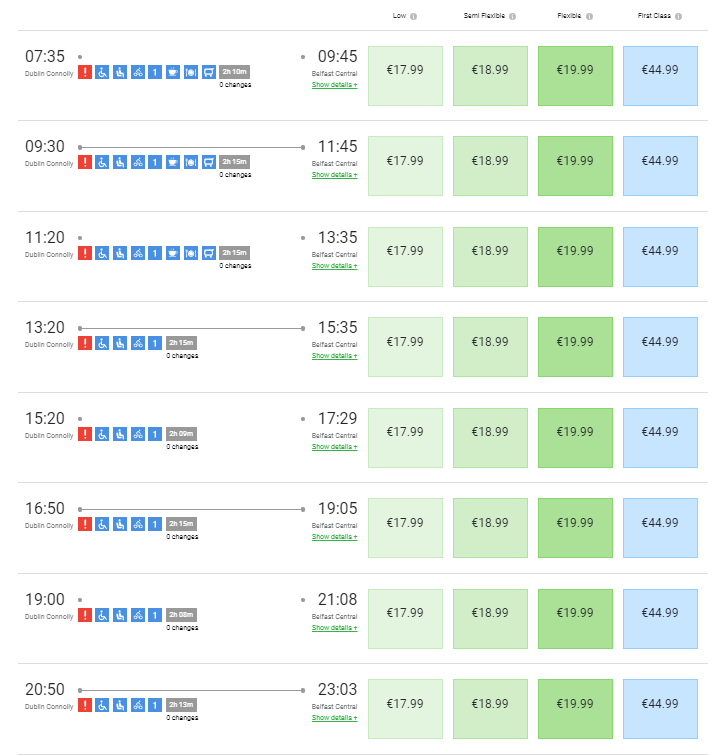 Irish Rail   was a bit of a surprise, in that its train ticketing experience involved going back in time 25 years to an era before demand-based pricing was even a thing. There was no variance in price by day or time, all tickets are valid on any service, and the fares are remarkably low – so more first class action! On the negative side, and in keeping with the retro theme, there’s also no scope for any kind of e-ticketing – we’ll need to go to the station before we travel and type a long code into a ticket machine to get our physical tickets. And there was no Amex option, because that would be too sophisticated or something. The site was relatively easy to use, albeit distinctly more NSW Trainlink than SNCF in levels of design flair (and only uses https for logins and transactions, which is dated as heck). The site and confirmation email didn’t contain information about how to go about any of the required things, aside from ‘find a machine and collect your ticket before you get on the train or we’ll fine you’. The Stena Line ferry from Belfast to Liverpool isn’t exactly a train, but might as well go in here anyway. The website was again a little bit wire-and-string but broadly OK, and the price seemed fairly reasonable (an overnight cabin is less than a three-star hotel). As with Irish Rail, there seemed to be effectively no demand management going on – and in keeping with the wire-and-string theme, there was no Amex option. And there was no information at all, even when manually searching through the site, on how to actually get to the ferry port as a foot passenger – I think a taxi is the best option, but I’m still not entirely sure . On the massive plus side, however, the Stena website allows extremely easy changing of times and dates after you’ve paid and had the ticket issued – which was lucky, because I got confused by the overnight-ness of the affair and originally booked the wrong night. This was immediately fixed online without having to face customer services helldeskery. The best and worst train ticketing experiences of the entire trip, though, were in Great Britain. The best was Virgin Trains (West Coast) from Birmingham to London, with West Midlands Railway from Liverpool to Birmingham a close second. Virgin and West Midlands use the same website booking engine (Trainline, which Virgin used to own), with slightly different front-end skins. It works very well. Virgin ticks all the train ticketing boxes that SNCF achieves above – simple presentation of services, cheap advance first class fares, free seat selection, Amex, e-ticketing, detailed explanation of what’s going on – and also adds tickets that you can display on your mobile phone as a mobile-optimised PDF without having to piss about downloading an app. The site is stable, is both aesthetically pleasing and good in UX terms, and manages to strike a really good balance between too simple and hellishly horribly complicated. West Midlands is almost the same, except that its services don’t have seat reservations so you can’t book those. But saving the worst til last: Brunel would be horrified if he had to book a ticket from London to Bristol on the Great Western Railway website. This is true for many reasons to do with culture shock and the impact of being resurrected from the dead, but even putting those issues aside, I think he’d still be annoyed at how bad their train ticketing process is. On the plus side, it takes Amex. On the minus side, literally everything else. The website (not a Trainline front-end) loads in a jerky, shuddering way that doesn’t make particularly clear whether it’s finished loading or not. The booking screen provides you with a list of train times and the lowest possible fare for the relevant train, but you need to click through each individual service to discover what the conditions are and what the first class rate is. Either deliberately or incompetently, it obscures the difference between advance (valid on one train only) and flexible tickets. Clicking through doesn’t actually give you details of the service, just the fare. The website doesn’t allow you to choose your own seats. There’s no scope to buy e-tickets – you have to print the ticket at a machine, or pay to get it posted to you. The most impressively bad thing, though, was the provision of information. The outbound train is on an engineering works day, during which the usual GWR London terminus of Paddington is unavailable and Bristol trains are instead running out of Marylebone, half an hour’s walk away. This rather important fact was invisible when booking the tickets (which just showed up as ‘London’), and would be easy to miss given the way it’s glossed over in a big text block in the confirmation email. It’s easy to imagine someone showing up at Paddington to collect their tickets, only to discover a closed station and a frantic taxi ride through west London. The correct approach would have been a large headline block on both the website and the confirmation email saying “please note that London Paddington is closed on 6 May 2018 and all services will depart from Marylebone”, along with a map and transport details of how to get to Marylebone and approximate delays to the journey time. SNCF would most certainly have done this. Great Western couldn’t be bothered. The first conclusion here is simply how much easier the train ticketing process is now that it was even five years ago. 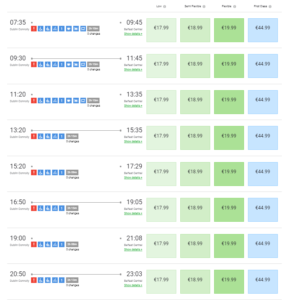 Everyone does online advance booking with overseas cards and addresses, almost everyone (shakes fist at Irish Rail and Great Western) lets you print e-tickets, and operators are starting to understand how to do seamless paperless mobile. The whole booking process for all of these tickets only took about as long as it took to write this post . The second conclusion is the extent to which the train ticketing experience is completely orthogonal to state versus private enterprise. SNCF is state run, but the ticket process is at the forefront of technology and extremely focused on demand management. Virgin Trains and Trainline are privately run, with a user experience and demand management ethos that’s almost identical to that of SNCF (although the mobile PDFs are brilliant). 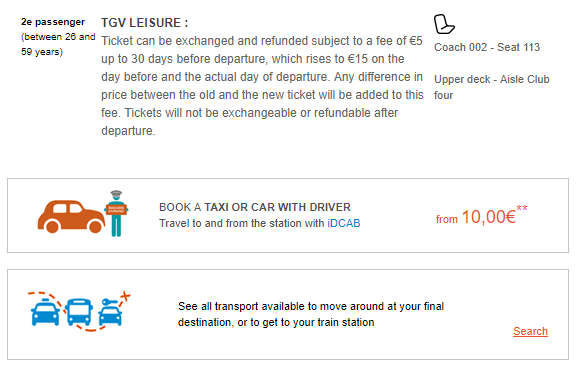 Irish Rail lives more up to the stereotype of a state operator, in that it’s perfectly adequate but technologically dated and doesn’t try and maximise revenue, but privately owned Stena does pretty much the same. The third conclusion is that Great Western is awful and First Group shouldn’t be allowed to run a whelk stall. Stay tuned for my review coming up in a few weeks of what the actual trains were like. Long-haul aviation is also bad, but harder to avoid if one wishes to travel the kind of distances that it features. I was slightly thrown by the SNCF site offering only ‘Mr’ and ‘Mrs’ as passenger title options. It turns out that rather than creating a marriage-neutral title akin to ‘Ms’, French non-sexist usage is to adopt ‘Mme’ for all women, which is fair enough. SNCF should probably have translated this to ‘Ms’ rather than ‘Mrs’ for their English-language site, though. Aside from the obligatory extremely large print warnings that you need to arrive ridiculously early in order to face the UK government’s pointless idiotic security theatre. For the cross-border Enterprise service, before the UK government’s Brexit lunacy combined with the aforementioned pointless idiotic security theatre turns it into two terminating trains north and south of Jonesborough with a march escorted by armed guards across the no-man’s-land in between. I was amused to note that the government agency under which Irish Rail now sits is called Transport for Ireland – almost as if everyone in the English-speaking world is nicking the name of the transport agency from the only place in the English-speaking world where transport is actually good. This post took slightly longer to write than it would have done in an ideal world because I didn’t think to take screenshots at the original time of booking.